AIRY APO80 apochromatic refractor, 80mm diameter, 500mm focal length (f6.25), FLP-53 apochromatic doublet, aluminum tube with 50,8mm Hybrid-Drive focuser with fine focus knob, 50.8mm OnAxisLock adapter, photographic tripod connection (mounts support rings available), rigid transport bag. 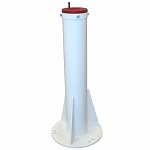 Optical power, mechanical quality and design features at the highest levels, all in a compact and easy to transport product: our AIRY APO80 apochromatic refractor offers all of this at an unbelievably low price! Thanks to its extraordinary lens with FPL-53 element, it offers a perfect chromatic aberration correction for images with no false color and very high contrast. Thanks to the short focal length (500mm), it can be used in astrophotography even with compact equatorial mounts (eg type HEQ5). In addition, the compact and lightweight body makes it a perfect instrument even for travel. 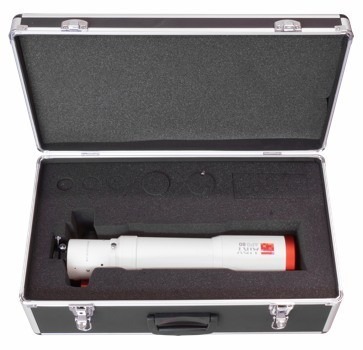 Telescope collimation and optics test included in the price! 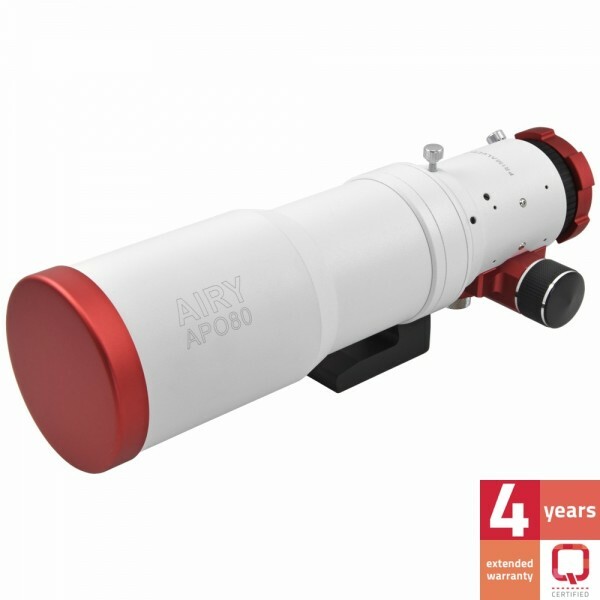 The apochromatic refractor AIRY APO80 uses as lens a doublet with FPL-53 lens fully multi-coated for a perfect chromatic aberration correction generating images with no false color, high contrast and rich in detail. This feature is perfect for long exposure astrophotography with color cameras (like DSLR), where the color aberration ruins photographs in not perfectly corrected telescopes. The short focal length (500mm) and the fast focal ratio (6.25) make it ideal for shooting wide field extended objects such as the Andromeda Galaxy (M31), the Orion Nebula (M42), or the Veil Nebula (NGC6992) that will be shown in their full extent also with cameras equipped with not too big sensors (and not too expensive). In order to maximize the quality of this apochromatic refractor using cameras with more than 15mm diagonal sensors (such as DSLRs), we recommend the use of field flattener which makes pinpoint stars up to image edges. Often refractors are provided with Crayford focusers suitable for visual use but not for photo applications. In fact, during the long exposures required by astrophotography, this type of focuser can cause camera slippage moving the sensor out of focus. 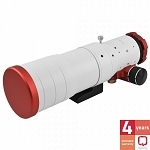 For this reason we have chosen to provide our AIRY APO80 telescopes with the new 50.8mm Hybrid-Drive focuser that adds, under the focuser tube, a rack and pinion thereby maintaining in position even heavy cameras (capacity of up 8 Kg). Below the focuser there's also a locking screw: closing it, you will be sure that your camera will not move any more! The 50.8mm Hybrid-Drive focuser features a convenient 1:11 fine focus gear, particularly useful when you need to focus at high magnification. The focuser has a very long ride (95mm) to allow the use of both photographic instruments (cameras with accessories) and visual (eyepieces and diagonals). For visual use, we recommend our 50.8mm XP dielectric diagonal for the observation of the sky or our XP 45° erect image prism for the one of terrestrial objects (use as a spotting scope). Using heavy photographic accessories such as DSLR or cooled CCD (often with filter wheels) cameras, it is crucial to avoid flexions when we insert them into the telescope's focuser. This also applies also to visual use when we connect large diagonal and wide field eyepieces (which are often very heavy). For this reason, the AIRY APO80's focuser has the new OnAxisLock locking device instead of normal thumbscrews. 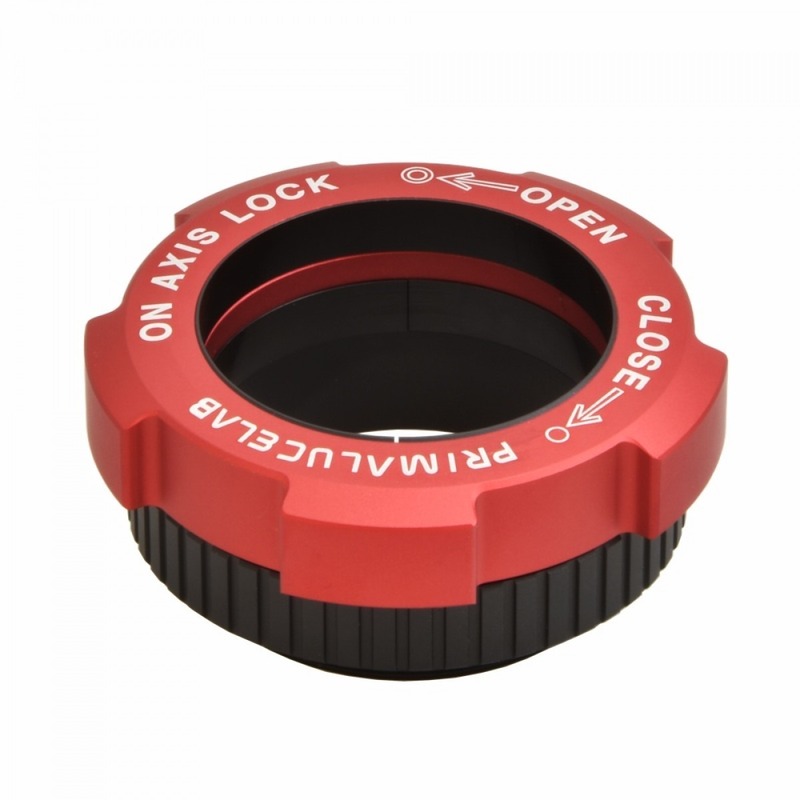 This allows you to perfectly lock the inserted accessory by rotating the outer (red) ring: a special inner ring tightens accessories with a uniform pressure. The OnAxisLock device also helps keep perfectly aligned on axis the accessories inserted into the focuser: you'll be so sure that the camera's sensor will be perfectly centered in the telescope optical axis. You will be amazed of the mechanical quality of our AIRY APO80: full aluminum intubation made with precision CNC machine is rugged yet lightweight. All the components are treated at the highest levels to provide an instrument with which is a real pleasure to photograph or watch the sky! The aluminum front dew shield can be closed to make the telescope more transportable. The front cap is completely aluminum made. 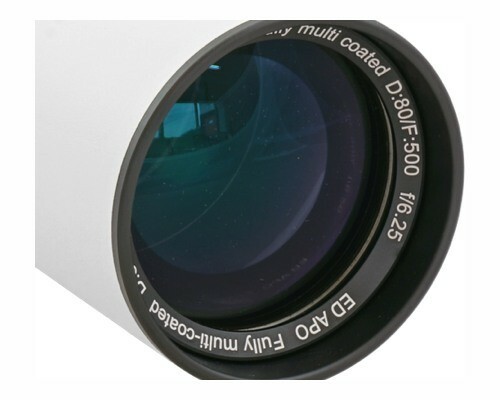 The focuser can be rotated freely through 360 degrees (without changing the focus point) to position the camera with the right angle and perfectly frame the object you want to record. Below the optical tube there's a metal plate which allows installation on photographic tripods (perfect for use as a terrestrial spotting scope). This plate has the shape of a Vixen dovetail bar then the telescope can also be installed directly on mounts with this connection. For long exposure astrophotography use we suggest our 90mm PLUS system support rings. The AIRY APO80 refractor is an optics and mechanics jewel, and to carry it or keep it protected at best, it comes with a beautiful hard case. Forget about the uncomfortable and weak support rings that are often found in cheap telescopes! Our AIRY APO80 apochromatic refractor can be used (optional) with beautiful aluminum anodized support rings, made with high precision CNC machines, which are part of the PLUS (Prima Luce Universal System) system. This gives you maximum freedom in adapting the telescope to your request; at the same time, it has all the threaded holes, holes and slots suitable for connecting all the PLUS compatible elements, always with simple M6 screws. For example, you can choose to install either a Losmandy or Vixen plate type, or you can use the holes in the upper part of the rings to install a telescope in parallel (through the guide rings PLUS compatible) or another dovetail plat equals to one located below the telescope (to position where you want guide rings or to allow the sliding Vixen + Losmandy dovetail clamp). Our complete line of accessories for AIRY let you personalize your telescope according to your needs. Always with quality and operating certificated instruments! 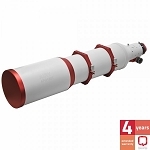 All our AIRY apochromatic refractors are equipped with extended warranty, 4 years (instead of 2 of the most telescopes)! This way you will be sure not only to have a great product but also with quality that lasts over time! 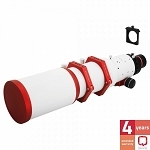 Each telescope is identified by a unique serial number which is also listed in the manual provided with the package. But our innovation doesn't end there. In fact we have developed Q-certified, a comprehensive control system that we work out in our laboratory prior to shipment and delivery of the product you ordered. In fact, before delivering the AIRY APO80 telescope, we test the collimation and the perfect functioning of all mechanical components. In addition, we pay much attention and care to shipping, carrying a sturdy packaging and giving it to the courier service. We want to be sure that you will receive your new AIRY APO80 not only in the shortest possible time but also with utmost care. Left: every AIRY telescope is identified by a unique serial number. Right: functional and collimation verification of optics on optical bench. For this reason, we have developed Q-certified, a comprehensive control system that we work out in our laboratory prior to shipment and delivery of the product you ordered. In fact, before delivering the AIRY APO80 telescope, we test the collimation and the perfect functioning of all mechanical components. - Connection for "DX-1 finder support for AIRY refractors"
AIRY APO80 Star Test performed recording with a color camera Betelgeuse star in intra focal position (left), focus point (center) and extra focal position (right). 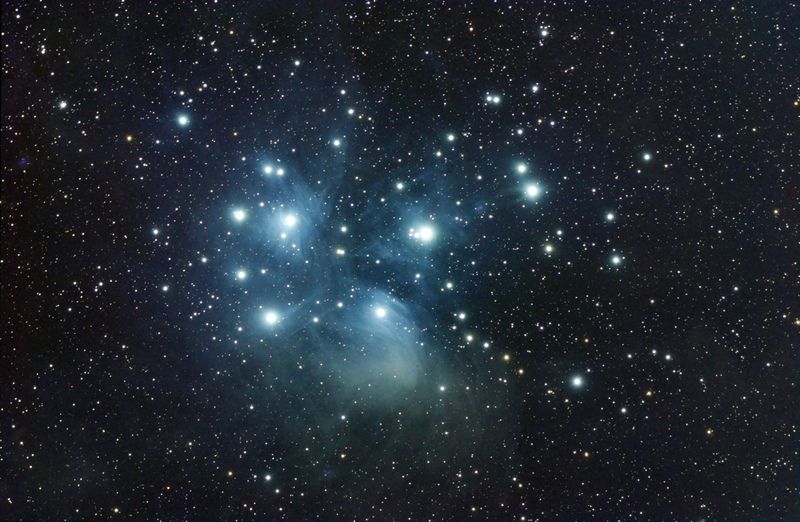 M45 (Pleiades) recorded by Filippo Bradaschia and Omar Cauz with AIRY APO80 (+ field flattener) and QHY10 camera. 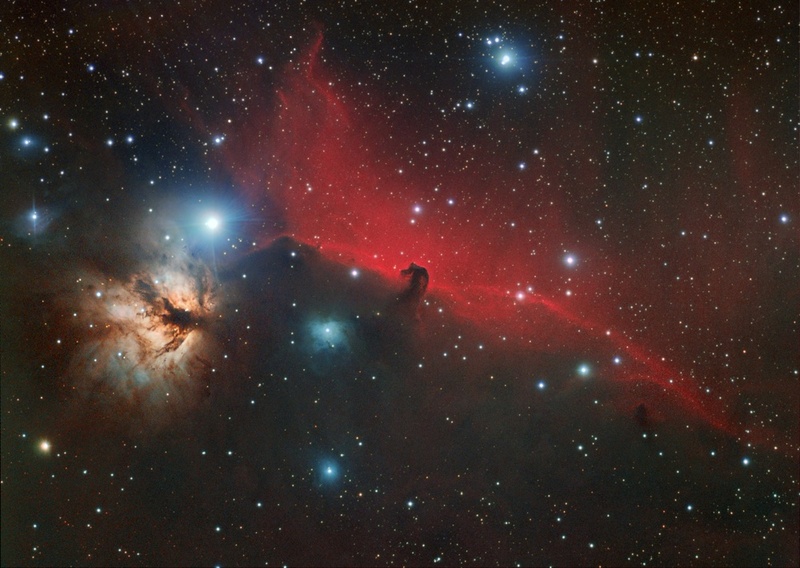 Horsehead nebula (IC434) recorded by Domenico De Luca with AIRY APO80 and SBIG ST-8300M camera. AIRY APO80 is also a great instrument for terrestrial photography: picture recorded by Stefano Savini. 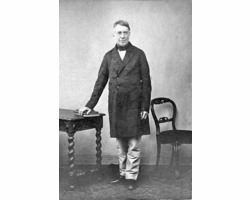 Sir George Biddell Airy (27 July 1801 – 2 January 1892) was an English mathematician and astronomer, Astronomer Royal from 1835 to 1881. His many achievements include work on planetary orbits, measuring the mean density of the Earth, a method of solution of two-dimensional problems in solid mechanics and, in his role as Astronomer Royal, establishing Greenwich as the location of the prime meridian. Usually ships in 7-14 business days, This item is custom made and will be made per your request. Payment is due in advance.